I’m not really prepared to talk about the stuff related to my old job – it’s completely unfair, not a rare occurrence, and exhausting because nobody seems to have a clue. I’m spending too much time waiting for people to get back to me, while I keep trying to get any information to dispute things (but no longer being employed, access to everything is gone). Orrin Grey – Cult of Headless Men (I thought I was supposed to get this as part of my subscription, but that’s gotten confused, so I just got it. If I get two, someone gets a freebie). V/A – The Bizarro Zombie Anthology That Wouldn’t Die. I’m sick of zombies, but enjoying listening to the Bizzong podcast.Got this to read more (any) Garrett Cook, and Gabino Iglesias and because it was massively on sale. Don Bassingthwaite – Cocktails at 7, Apocalypse at 8 – I’ve heard him read the same story twice, but it’s so much fun that if the rest of the book is half as good, I’ll be laughing the whole time. I bought it at a reading with him, Gemma Files, and Michael Rowe. Good night! Brett Savory – A Perfect Machine I’ve got the audiobook version too, because the reader has a nice voice. I’ve been listening rather than reading so far, and missed a few bits because I’m not used to the Audible app for Android. I don’t think the major complaint about people not having enough contextual info will bother me. I’m also forewarned. In the meantime, I noticed that the “Women in Horror” tag isn’t capitalized. Not sure how that happened – I must have entered it that way once. I’m going to try and update those tags over the next month. I also painted a Caitlin R. Kiernan tribute mini for Women in Horror. 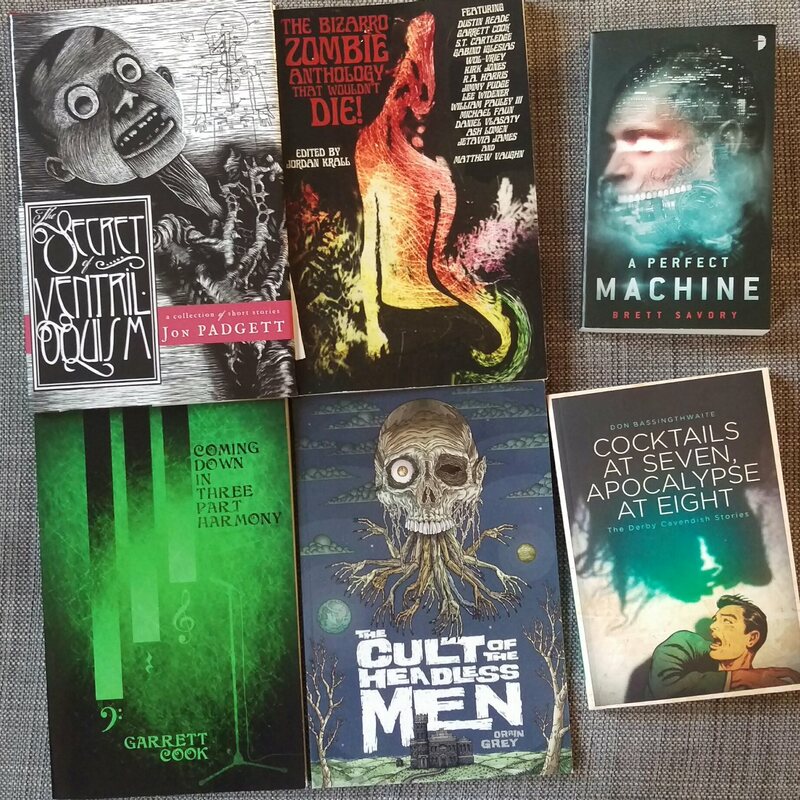 Undertow Publications has a handful of copies of the first Best Weird Fiction, which can be ordered directly instead of paying crazy resale prices. But if you miss it, it’s gone. Attend or Support the Outer Dark Symposium of the Greater Weird. This is how you get tickets. Or you can buy stuff if you can’t make it, and to help support the event. Attend the Spec-Fic Colloquium. This is local so I’ll be there. I think early bird tickets are done (they are time sensitive). Dunham’s Manor has both a Patreon and an exclusive NecronomiCon book (Xynoybis #0) available at the con or for a limited time in advance to fund a merch table. The annual Friends of the Merril short story contest is open until April. I’d like this to be the year I submit something.